Planted firmly on the lawn of Aliiolani Hale, the State Supreme Court building, is the most visited of all the statues honoring King Kamehameha I in Hawaii. 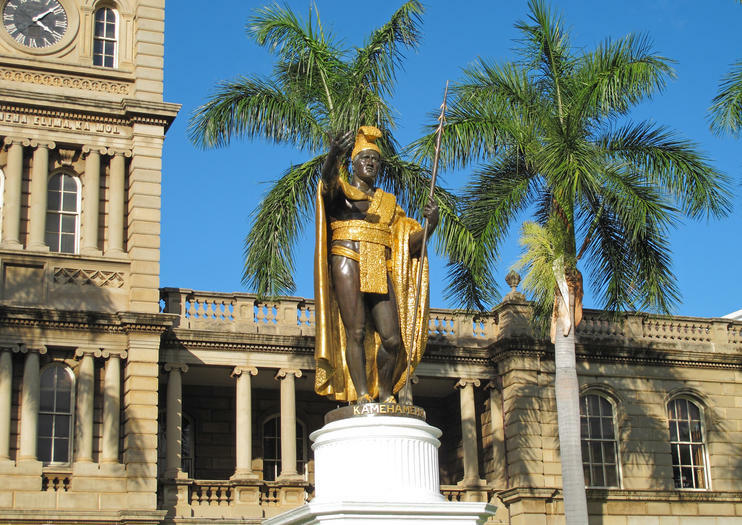 The 18-foot bronze icon with golden-colored detailing was erected in 1883 and depicts a spear-wielding and cloak-draped Kamehameha the Great, the first Hawaiian monarch and the ruler credited with uniting the Islands under single rule in 1810. Each year on a date near the June 11 state holiday commemorating King Kamehameha, community groups build massive flower lei garlands and drape them over the Honolulu statue using the ladder from a fire truck. The popular lei draping ceremony commemorates the King’s significance and kicks off week-long celebrations of colorful parades and festivals throughout the Islands. The story of the statue’s procurement also undoubtedly adds to its allure: Constructed in Europe, the sculpture took several years to make, and, when finally finished and rounding the horn of South America, (the Panama Canal wasn’t completed until 1914) the ship carrying it wrecked near the Falkland Islands. Using insurance money, a second statue was quickly built and arrived in Honolulu without incident; this is the statue that stands here today. Meanwhile, Falkland fishermen were able to retrieve the sunken original and sold it to back to the then-U.S. territory, where the strikingly similar sculpture still stands not far from the king’s birthplace on Hawaii Island. Another Kamehameha figure, made from molds of the Honolulu version, is one of two statues representing the state of Hawaii in the National Statuary Hall in the U.S. Capitol Building in Washington, DC. Honolulu’s King Kamehameha Statue sits in the center of Aliiolani Hale’s circular front lawn at 417 S. King Street in the downtown government district. Several TheBus public transit routes pass alongside the statue leaving from Waikiki, and visits to the statue are also included in many Honolulu-area tours. If you plan on watching lei draping commemorative ceremonies on or around June 11, be sure to arrive before the usual 5 p.m. start time to get the best vantage. Island hop to Oahu for a full-day immersion in Pearl Harbor history with this all-inclusive tour from Kauai. With all airfare, transfers, admission tickets, and skip-the-line entry to attractions arranged, you can focus on absorbing the importance of monuments like the USS 'Arizona’ Memorial and Ford Island’s USS 'Missouri’ battleship, and delve deep into Hawaii’s World War II history with entry to the Road to War and Pacific Aviation Museums. The line to visit the USS Arizona Memorial at Pearl Harbor starts forming at the crack of dawn and, due to high demand, there are often more people in line than tickets available. However, you can skip the line and hassle by booking this private guided tour. After visiting the memorial, accompanied by your guide, your excursion continues with a tour of downtown Honolulu, visiting such attractions as Iolani Palace and the King Kamehameha statue. Travel with a small group to Pearl Harbor, one of Oahu’s most significant attractions. This 6-hour excursion includes a guided tour of the USS ‘Missouri’ plus skip-the-line admission with an audio tour of the USS ‘Arizona’ Memorial. At the Pearl Harbor Visitor Center, see film footage of the World War II attack on Pearl Harbor. Then drive past the historic landmarks of downtown Honolulu including the King Kamehameha statue, Iolani Palace and the Hawaii State Capitol. This all-inclusive Pearl Harbor tour includes much more than a tour of the Pearl Harbor grounds and museums. You also visit other main attractions such as the USS Arizona Memorial, Pacific Aviation Museum, and King Kamehameha Statue, all while learning fascinating Honolulu history from your guide. Lunch and transportation are taken care of for a hassle-free tour. This comprehensive tour is perfect for history lovers and includes inter-island plane tickets, chauffeured airport transfers, a friendly driver and entrance to two of Hawaii's top naval attractions. Tour USS Arizona and Pearl Harbor with a small group, or venture through these historical icons on your own. You don’t have to wait in line behind thousands for USS Arizona Memorial ticket, since they're included in the tour. Get a comprehensive overview of Pearl Harbor's history during this 7-hour trip from Kauai. Make the most of your time with skip-the-line access to the USS Arizona Memorial and the USS Missouri, then explore both sites with included audio guides. Round-trip flights from Kauai included. This 6-hour excursion to Pearl Harbor includes skip-the-line admission to the USS ‘Arizona’ Memorial and Pacific Aviation Museum. Travel with a small group and experience two of Oahu’s most significant attractions via audio tour. At the Pearl Harbor Visitor Center, see film footage of the World War II attack on Pearl Harbor. Then drive past the historic landmarks of downtown Honolulu including the King Kamehameha statue, Iolani Palace and the Hawaii State Capitol. Round-trip transport available from Waikiki hotels and other locations. Explore the naval and aviation history of Pearl Harbor during this 7.5-hour excursion offering a combined visit to the USS Arizona Memorial, a stop at the newly-opened Pacific Aviation Museum and sightseeing tour of downtown Honolulu. Take a moving trip by Navy launch to the USS Arizona. Then admire rare WWII Japanese and American planes at the Pacific Aviation Museum. Finish your day exploring some of Honolulu’s most famous landmarks. Your trip includes museum admission, a guide and round-trip hotel transport from Waikiki. As one of O'ahu's most-visited sites, Pearl Harbor National Memorial draws long lines of visitors daily. Avoid waiting for hours in the ticket line by joining this tour that includes admission to the USS Bowfin Submarine Museum and Park, USS Arizona Memorial, Pacific Aviation Museum Pearl Harbor, and Battleship Missouri Memorial. Lunch included. Combine visits to downtown Honolulu, Pearl Harbor, and the USS Arizona during a half-day tour departing from Waikiki or Kahala. In a climate-controlled tour vehicle, travel between the area's disbursed landmarks, spending time listening to your guide's informative commentary at each. Round-trip transportation from Waikiki and Kahala hotels provided. Enhance your experience of the Pearl Harbor Memorial with this group tour from Waikiki. Transfer from Waikiki directly to the memorial, and expedite your entry to the USS Missouri Battleship, the USS Bowfin Submarine, USS Oklahoma and the USS Arizona Memorial with prepaid tickets. Learn about the history of all the important Pearl Harbor sites from a combination of video footage, audio headset and local tour guide. On the return trip to Waikiki, enjoy a complimentary tour of downtown Honolulu. The historical significance of Pearl Harbor resonates around the world, and this small spit of land in Hawaii has the crowds to match its reputation. Skip the lines and guarantee access to Pearl Harbor’s memorials, including the USS Arizona and Missouri, by booking in advance. This tour includes informative guided commentary, transportation in a comfortable minibus, and more to ensure a seamless and educational trip. Visit some of the most-popular Pearl Harbor sites, including the USS Arizona and the USS Bowfin submarine, on this 6-hour, small-group tour. Enjoy a chauffeured transfer to the Pearl Harbor Visitor Center where museums and galleries tell the story of the attack on Pearl Harbor and World War II. Explore one of the most famous submarines in the world and receive a complimentary audio set. Then enjoy a drive-through tour of some of the most popular sites and structures in the historical city of Honolulu. Waikiki hotel or port pickup and drop-off included. Visit Pearl Harbor World War II Valor in the Pacific National Monument. Arrive at the USS Arizona Memorial by boat and see the final resting place for 1,177 servicemen who lost their lives on December 7th 1941. The tour includes a sightseeing trip to Downtown Honolulu to view historic sights like Iolani Palace, once home to Hawaii’s royalty, and the National Cemetery of the Pacific. Don’t worry about getting from place to place, and soak up the history on this tour.